What is the Philippine International Trade Expo? The Philippine International Trade Expo is a forum to encourage trade between Hawaii, the Philippines, and the rest of the world. Never before has such a venue been available to encourage commerce in this way. Buyers, sellers, merchants, traders, wholesalers, retailers, and intermediaries will be coming to Hawaii from the Philippines and elsewhere for the sole purpose of opening trade between our respective islands. Hawaii sellers will have the opportunity to meet overseas buyers and vice-versa. The variety of products will be impressive. Art, furnishings, clothing, food, beverages, health and fitness items, various services, and much more will be presented. What is the Hawaii Goods & Gift Show? The Hawaii Goods & Gift Show is part of the Filipinos in Hawaii Centennial Celebration. It is an opportunity to showcase Made in Hawaii Goods and Gifts as well as crafts, foods, and more to the Filipino community in Hawaii and to buyers from the Philippines. The event will be visited by visitors and residents alike and provides a unique venue for product exposure and sales. It will be a high-energy event with fantastic networking possibilities. Go to the REGISTRATION page for more info on how to register, or just call Pacific Expositions at (808) 945-3594 Monday through Friday, 8 AM - 5 PM Hawaii Standard Time. Is this Expo part of the Filipinos in Hawaii Centennial Celebration? Yes. The Expo is a part of the Filipinos in Hawaii Centennial Celebration. 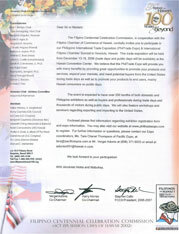 Read the letter from the Filipino Centennial Celebration Commission.